At the first stages of the company's existence, all the necessary documents are created by employees in office programs, and the exchange of information passes quickly (it is enough to contact the right employee). But as the company grows, when different departments (personnel, accounting, etc.) are formed, each of them forms its own database. This, subsequently, makes it difficult to exchange information between departments, which slows down the work. In such conditions, it will be very difficult to achieve high management efficiency, resource optimization and increased productivity. The ERP system comes to the rescue, which forms a single database for all the company's divisions. This is one of the best solutions that you can have in order to manage all your business processes smoothly and prosperously. The ERP (Enterprise Resource Planning) is a system for managing and controlling business processes, labor resources, finances and assets, focused on optimizing and increasing the efficiency of the company. The ERP system maintains a single database for all departments and tasks, so that access to information becomes easier, and most importantly, the units are given the opportunity to exchange information, and each employee knows which business processes or parts of business processes he is responsible for . 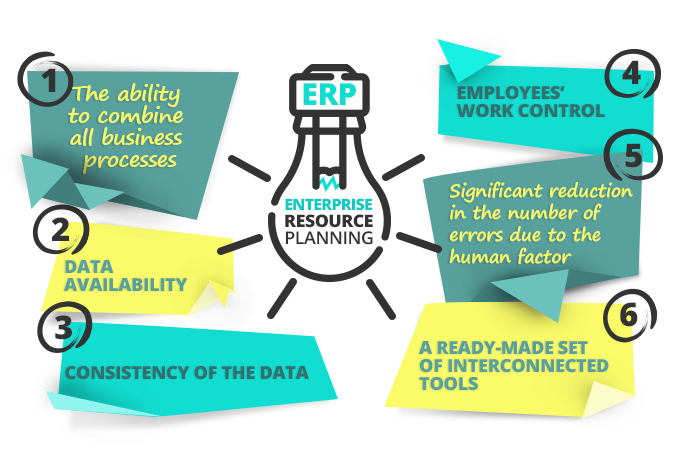 What are the main advantages of ERP implementation? The ability to combine all business processes in one powerful and convenient system. Data availability. Once entered, the data becomes available within the whole system, without reconciliation, additional coordination and verification. Consistency of the data. The use of a common database avoids the stages of reconciliation and coordination of data. For example, if the design department introduced and approved a project, the procurement department can use the data from this project to work immediately, without an additional confirmation steps. Employees’ work control. In the case when one of the divisions enters data, for example, about the flow (transfer) of the goods, the other department immediately receives information about it, and after actually obtaining the listed items, puts it on the parish. The discrepancy in figures in this case is almost impossible, the general database excludes the possibility of many misuses, and the head in real time can reveal any discrepancies and their causes. Significant reduction in the number of errors due to the human factor. The unified system will not allow you to write off the goods from the wrong warehouse, since the general database will indicate that the goods are not there. Information about payments will be transferred to the accounting department and the sales department automatically based on data from the bank or cash register, which also excludes errors. Technical parameters and project data will also be transmitted automatically, without distortion, etc. A ready-made set of interconnected tools. For example, if the sales department creates an invoice, then it is the basis for the automatic creation of accounting documents, and after payment - the expense documents from the warehouse. In order to summarize it can be said that implementation of ERP system results in increased revenue, cost-cutting, waste reduction, mistake prevention, satisfied customers, business growth and more. It is a cyclic process since there is always room for improvement within a process. These improvements will also help the communication inside the company. If one employee understands what the other does, the processes will flow better, the performers will be happier, and the company will be healthier.